Michael could be described as a below-average student. He can read at grade level, but just barely. When he is asked to read aloud, he balks and gets embarrassed because he has trouble sounding out bigger words. He doesn’t always understand what he has read. He gets frustrated when the “smart” kids speed ahead on a task. Michael reads below grade level and struggles to learn. Struggle can be a good thing and lead to deeper learning. We call that fruitful struggle. But damage is done by fruitless struggle against a hidden obstacle to learning that can seem insurmountable. Students who struggle fruitlessly become demoralized. So do the teachers who are trying to help them learn. Michael feels that school is not for him. It turns out, though, that Michael is not “below-average,” at least not in potential. He has good processing speed and reasoning ability for his age and very strong memory skills. His main issue is with auditory processing, which has been masked by his ability to memorize sight words. Weak auditory processing skills impede Michael’s ability to sound out words. How do we know all this? Michael took The Gibson Test, a nationally normed cognitive skill screening tool. Here are his results represented graphically in the PASS+ Learning Profile™ one of several points of data analysis that make up the complete report of The Gibson Test results. 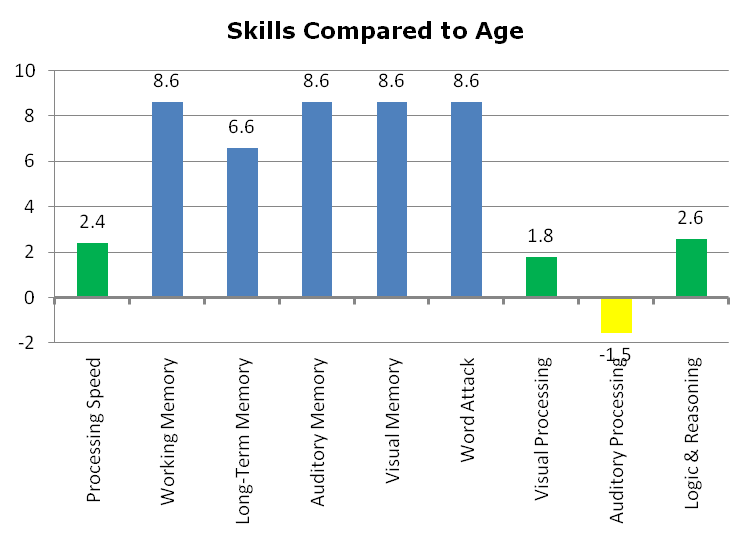 These numbers represent the skill level in terms of the number of years above or below the child’s age, represented as the zero baseline. Michael’s auditory processing score indicates that his skill level is approximately 1.5 years below the average competency for his age. All other skills are above the baseline, with memory skills and word attack being the strongest. While teachers easily recognize students like Michael who are under-performing academically, the challenge has been to understand the root cause of the struggle and develop an appropriate learning plan for those students. Even high-performing students may struggle to compensate for underlying weaknesses, where strength in one area temporarily masks weakness in another, just as the ability to memorize masked Michael’s auditory processing challenges.With insights gained from The Gibson Test, combined with direct observation of Michael’s academic performance and approach to learning, teachers can now chart a plan that will strengthen Michael’s skills.We recommend 20 minutes per day of computerized PASS training in sound analysis, which will assist Michael to master complex codes and sound out bigger words. That skill, combined with his ability to reason out the meaning of now familiar-sounding words in context, will greatly improve Michael’s reading comprehension and fluency. He’ll read aloud more confidently. Success in this area will give him a needed boost in other areas where his true strengths can come fully into play. School will look like a friendlier place to Michael. He represents the many students who benefit from the Power to Know.It is important to note that while the deep causes for a child’s learning struggle are individual and may be complex, research demonstrates that the effects may be addressed directly and remedied because of the brain’s capacity for growth and change, the science of neuroplasticity. At CogREAD we have found that direct intervention at the cognitive level is enhanced by mentoring support to build performance character traits such as persistence and the ability to delay gratification. We find, in turn, that strong character trait development is enhanced by cognitive success. When students have a breakthrough moment and “get it,” they can connect “being good” with “doing well,” a powerful lesson in the intrinsic rewards of learning. Research has also demonstrated that with appropriate intervention 94-99% of all students should we able to read by the third-grade reading milestone. CogRead’s mission is to help all schools achieve those results. We provide tools that rapidly and efficiently profile an individual student’s learning skill strengths and weaknesses, giving teachers the power to know how to reach each child. The Gibson Test takes just 35 minutes to complete and results are available immediately. To learn more about how The Gibson Test works and see data that tells the untold stories of other real students like Michael who struggle to learn, click here. To gain access to the Gibson test for your school, click here.